KEEP THE FAYE designs by Faye Passow. 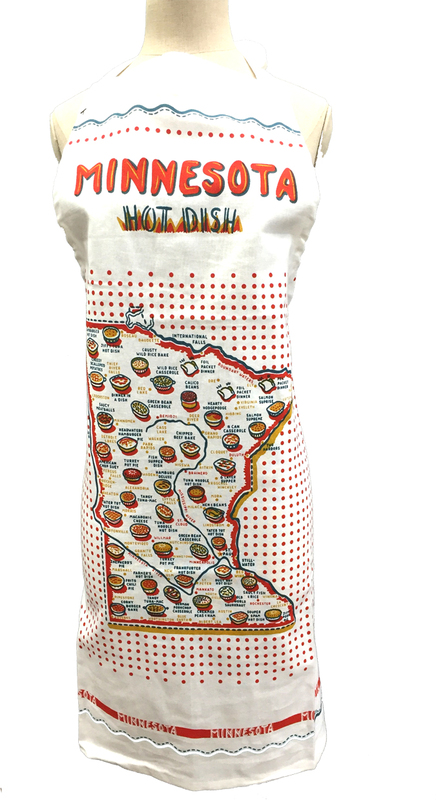 A colorful, whimsical apron with a map of Minnesota and its regional hot dishes, from the Cheesy Scalloped Potatoes of Thief River Falls to the Headwaters Hamburger Pie of Park Rapids, designed by Minnesota artist Faye Passow. CARE: Machine wash, cold. Tumble dry low. Faye Passow is a Minnesota artist and creator of unique and high quality gifts. Proudly give these as gifts, and/or treat yourself !